5 Axis Machining has traditionally been regarded as advanced technology best suited to the aerospace and automotive industry. 5 axis machining offers many advantages, all of which are now being applied to the mould and die sector. VISI Machining 5 axis module provides the operator with a productive solution for creating highly efficient toolpaths with advanced collision control for the most complex 3D data. VISI can work directly with Parasolid, IGES, CATIA v4 & v5, Pro-E, UG, STEP, Solid Works, Solid Edge, ACIS, DXF, DWG, STL and VDA files. The extensive range of translators ensures that users can work with data from almost any supplier. For complex 5 axis programming it is often necessary to tweak the geometry so companies working with complex designs will benefit from the simplicity with which their customer's CAD data can be manipulated. Many complex moulds contain deep cavity areas and small radii which need to be machined with small diameter tools. Generally this would involve the use of tool extensions or longer tools which would increase the risk of deflection and provide a poor surface finish. By approaching this from a different angle, the head can be lowered and the collision detection will automatically tilt the tool and holder away from the work piece. The major advantage of this strategy is the use of shorter tools which will increase tool rigidity, reducing vibration and deflection. As a result, a constant chip load and higher cutting speed can be achieved which will ultimately increase tool life and produce a high quality surface finish. In more shallow areas, larger bull nose cutters can be used with a small lag angle. The major advantage of this approach is a lower number of toolpath passes which also reduces machining time and improves surface finish. All 3D toolpaths can be converted to 5 axis operations which dramatically increases the number of strategies available to cover any scenario. 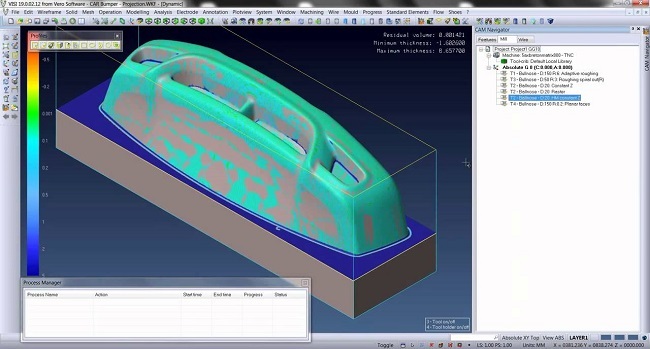 Using this approach will apply high speed machining technology to 5 axis toolpaths. The 3D > 5 axis conversion provides intelligent collision detection and will automatically tilt away from the piece only when required. This type of semi-automatic toolpath will dramatically speed up programming and shorten the learning curve. Turbine / blisk machining is commonly performed using 4 axis. The turbines or blisks are often rough machined using various methods including plunge roughing which can be applied to the toolpaths and is a useful approach but turn milling is often the most common. Turn milling allows the highest values for chip volumes per minute, regular engagement of the tool leading to a smooth cut, a balanced spindle load and a constant movement in all 5 axis, reducing any reciprocating movement in the fixturing system. Finishing is the most important part of the process and a continuous spiral toolpath along the part is required to achieve the necessary surface finish for these complex parts. The aim should always be to achieve a very regular, uniform level of residual material — if necessary, through multiple semi finishing operations. Particular care needs to be taken when choosing the tool for finishing and by allowing larger tools to be used while offsetting in one of the axes allows more of the tool to be in contact with the part creating smaller cusps and an improved surface finish. VISI provides all the necessary tools for successful 5 axis impeller machining. High surface quality, limited space and the angular motion of the rotational axis make the machining of impellers one of the most complex 5 axis machining tasks. VISI creates each toolpath with an even distribution of co-ordinates. By sending smooth and efficient CNC code to the machine tool control, it will reduce unnecessary vibration and lessen the impact on thin rib geometry. Surface finish is a critical requirement for impeller finish machining and any surface marks can be eliminated using smooth axis movements. Positional (3+2) machining allows both 2D and 3D toolpaths to be used at a fixed angle. The traditional benefit is the reduction of multiple setups. The ability to orientate the head to the correct position automatically will significantly cut machining time and reduce the need for multiple fixtures. Similar to continuous 5 axis, positional machining also allows the machining of undercuts and enables the usage of shortened cutters for rigidity and improved surface finish. 5 axis trimming is a common application especially used in the automotive or vacuum forming industry for groove milling or boundary trimming. For this type of strategy, the tool position is calculated normal to the face direction following a drive curve. For additional control, synchronisation curves can be used to control the tool movement in local areas. The potential direction changes are at there most extreme when using this type of strategy so the collision detection and toolpath simulation are an invaluable tool. The smallest movement of the cutter can result in large movements in all axes of the 5 axis machine as each movement is amplified via the tool, holder and spindle. In the case of a collision, VISI provides multiple methods for collision avoidance using smooth axis movements. The collision avoidance strategies include cutter retraction along the tool axis, tool tilting for holder collisions and pulling the tool away from the work piece in a given direction. In addition to the automatic collision avoidance, the rotation axis can also be restricted to user-defined axis limits preventing over travel of the spindle. An extensive library of postprocessors is available to suit most machine tools. In addition all postprocessors are fully configurable to suit individual requirements. Canned cycles for drilling and boring, subroutines and cutter compensation can be output along with 3+2, and full 5 axis CNC code for use on the shop floor. Bespoke post processors can also be written for complex one-off machine tools. Set-up sheets are automatically generated with information about the datum position, tooling, cycle times, cutting envelope etc. The contents and layout of the set up sheet can be tailored to match the needs of each user and output as either HTML or XLS format. Toolpath verification can be applied using the real machine dimensions and limits with the kinematic simulation including the motion display of all rotational and linear axis. Cutting tool, holders, jigs and fixtures can all be checked when running the kinematic display. Any gouges on the toolpath against stock, tool or any other part of the machine tool will be graphically highlighted. A comprehensive list of tested 3, 4 and 5 axis machine are available. Vero engineers are also available to help with the construction of any bespoke machine.